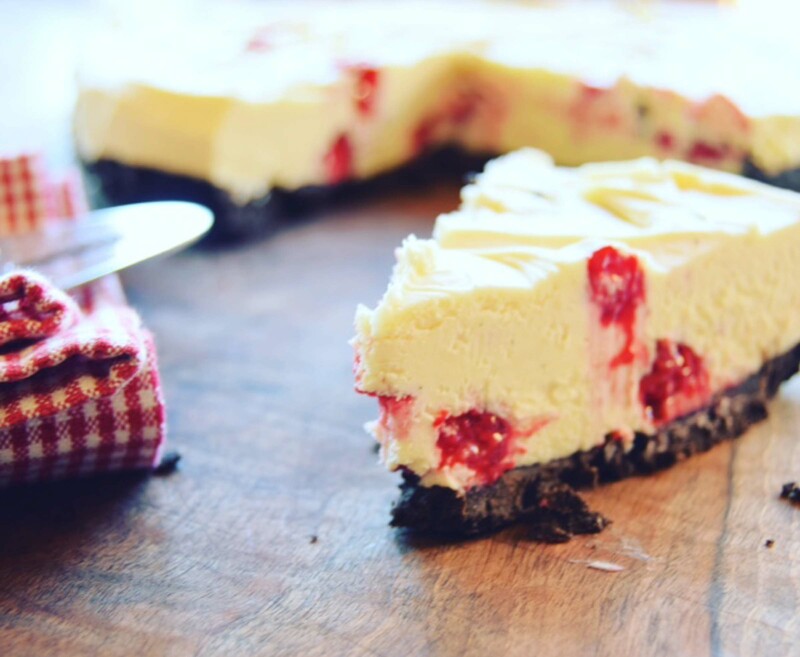 I use to make this cheesecake a lot for friends when they came over for dinner, it sounds really rich and sickly but actually is very light and also moreish. I don’t have the biggest sweet tooth but I couldn’t stop eating this the other day!! I make my base thicker than normal cheesecake bases and use Oreo cookies so it is a dark chocolate crunch to go along with the white chocolate cake. The raspberries sweeten this nicely and also make it look really pretty. 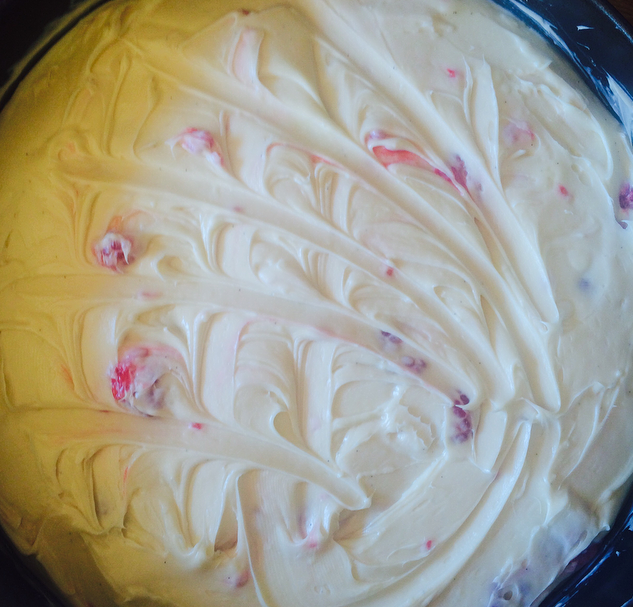 The recipe is simple to make and yet a crowd pleaser….. give it a go!! To make the base blitz the Oreo’s up in a blender to make crumbs them pulse in the butter until well combined. Alternatively, pop biscuits into a clear bag and seal, then bash with a rolling pin until they are crumbs then stir into the melted butter until combined. Grease the base of your cake tin then press the biscuit crumbs evenly onto the bottom. Place in the fridge whilst you prepare the filling. Break the chocolate into even pieces and place in a glass heat proof bowl above a pan of boiling water, making sure the bowl does not touch the water. 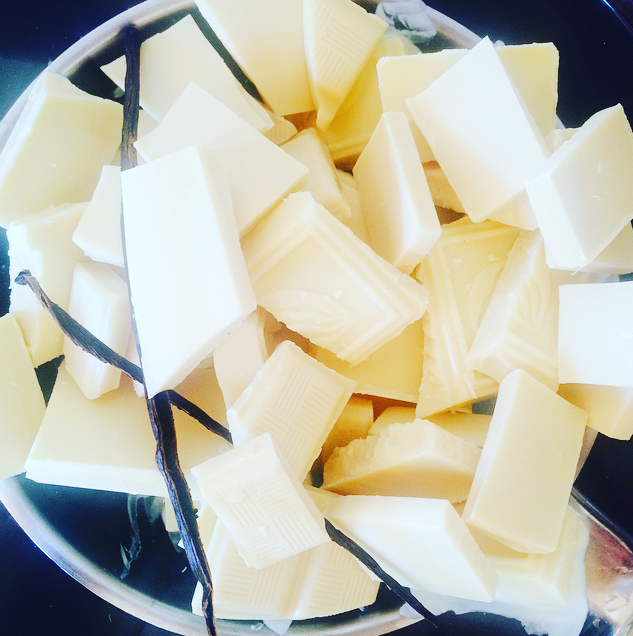 Halve the vanilla pod and place them into the bowl with the chocolate. Let the chocolate melt. Once melted remove from the heat and remove the vanilla pod, let the chocolate cool a little. It is tricky to find double cream here in Spain, I can only find the long life stuff, which is fine but it does tend to whip up and react differently to fresh cream. Therefore, if using this I would whisk this up a little first to thicken before adding the other ingredients. 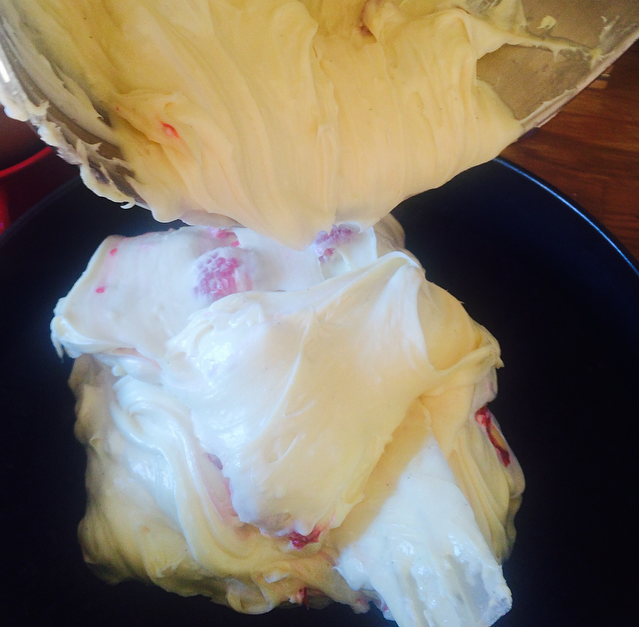 Once it is thick like whipping cream add the sugar and mascarpone and whisk until well combined. 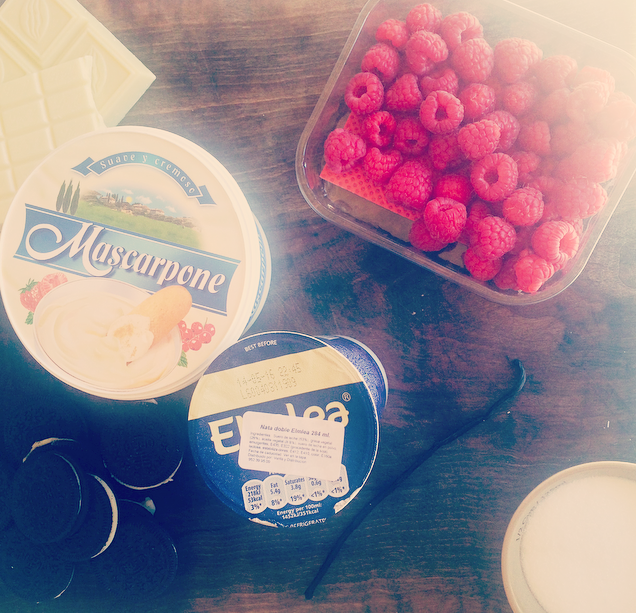 If using fresh cream, you can just add the cream, sugar and cheese in together and whisk all at once. Now pour in the cooled chocolate and gently stir. Then add the raspberries and mix well, I squeezed a few in my hands first so that they split and coloured the mixture pink and streaky. Once all combined pour onto the base and even the top. Place into the fridge for a few hours, but if possible I would do this the day before and let it stay in the fridge overnight. Once cooled and hardened carefully remove the cake tin, get a palette knife and run it between the cake tin base and biscuit base and it should then easily remove fully. Serve up!! Once all combined pour onto the base and even the top. Place into the fridge for a few hours, but if possible I would do this the day before and let it stay in the fridge overnight.